January 31, 1926 - William N. Muster, Sr., Bill Muster's father, dies in Valparaiso, Indiana. 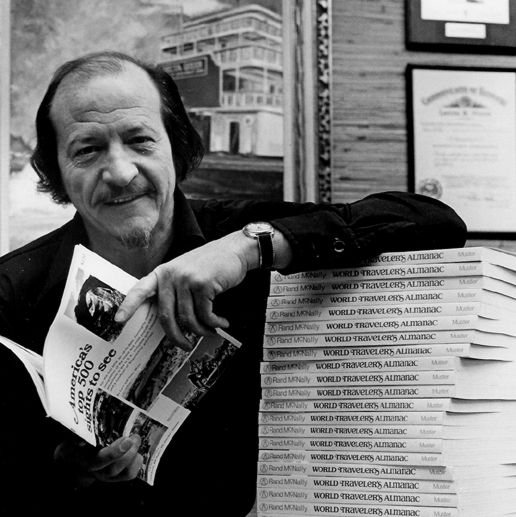 June 18, 1926 - William N. Muster born in Valaprasio, Indiana. 1930 - Census records show Bill Muster living in an apartment at 6218 South Lincoln, Chicago, Illinois, one of eight people, including his grandparents, Ernest and Otila Moldenhauer, his mother Emma, his older half-brother Ed Miller, along with his aunt and uncle, and their daughter. Bill was the youngest - four years old. July 12, 1930 - Ernest Moldenhauer, Bill Muster's maternal grandfather, dies. October 10, 1931 - Barbara Muster, Bill Muster's paternal grandmother, dies in Valparaiso, Indiana. There is no record of Emma or Bill attending the funeral. We believe Emma was estranged from the Muster family after William Muster Sr. died, and she left Valparaiso sometime between 1926 and 1930. John Muster, Bill Muster's grandfather, had died October 16, 1887, of wounds sustained in the Civil War. September 21, 1934 - Otila Moldenhauer, Bill Muster's maternal grandmother, dies. Oct. 10, 1934 - Emma Moldenhauer Miller Muster, Bill Muster's mother, dies, leaving Bill an orphan. He lives in an orphanage for a short time, but his older half brother removes him from the orphanage after Bill complains of abuse. c. 1935-1944 - Bill lives in a series of foster homes, ages nine to eighteen. As a teenager, Bill buys a camera and takes up photography. 1940 - The 1940 census records show Bill listed as a lodger with a family in Chicago. 1941-1944 - Bill lives with the Molitor family in Chicago foster home from ages fifteen to eighteen. * The Molitors, including one of the boys in the home, Bill Tanzer, remain in contact throughout life. When Bill Muster moved in with the Molitors, they temporarily changed his name to Bob to avoid confusion with two boys both named Bill. In 1944, Bill Tanzer joins the army and encourages Bill to join too. 1943 - Chicago Tribune copy boy. 1943-January 1953 - ACME Newspictures photographer, editor, bureau manager; worked for Charlie Payne. 1944 - Travels by automobile from Valaprasio to Bremerton, Washington with his half-brother Ed Miller to work in the shipyards refurbishing ships for the War effort. June 1944 - Graduates from Bremerton High School. Returns to Chicago and joins the Army, along with his friend Bill Tanzer, from the Molitor foster home. Bill goes through basic training in Las Vegas April 2-June 23, 1945, then joins the Army in Seattle, November 15, 1945 (five days before the start of the Nuremberg Trials). Feb. 1947 - June 1950 - Works his way through college at the University of Illinois with freelance writing and photography, the GI Bill, and summers jobs at Alexander & Associates of Chicago, a creative service agency, as a staff photographer. He photographs the Chicago Railroad Fair in 1948 - 1949 and the Chicago Fair of 1950. At the University of Illinois he is photo chief and associate editor of the University of Illinois yearbook and Illini daily newspaper. Member of Sigma Delta Chi journalism fraternity. June 18, 1950 - Graduates with a BA in Journalism-Advertising, University of Illinois, School of Communication. 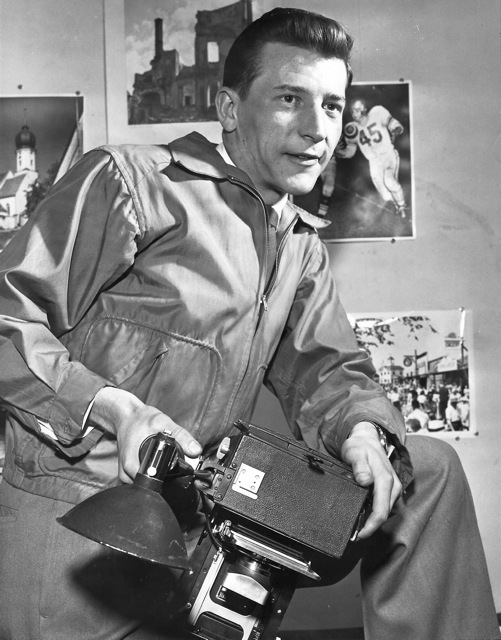 Sept. 1950 - Jan. 1953 - Returns to ACME Newspictures as a writer, editor, and photographer in Chicago. Moves with his wife to Minneapolis, Minnesota, to become a bureau manager for ACME Newspictures. Jan. 1953 - Bill and Paula move to Los Angeles, where they both go to work for Hollywood Electronics. Paula runs the front office until 1956; bill works for nine months as a sales representative doing in-store sales and off-site sound installations. 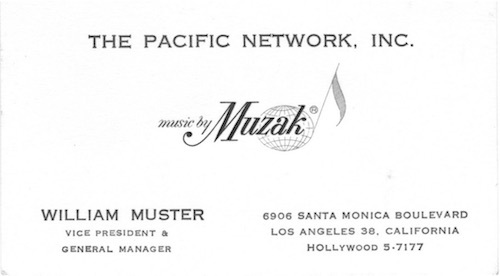 Aug. 8, 1958 - Son Bill M. Muster born in Los Angeles. May 1959 - 1961 - Marketing manager for Ampex Corporation, United Stereo Tapes division. 1961 - 1989 - Moves with family back to Los Angeles. Works for the next twenty-eight years from his office at 6900 Santa Monica Blvd. Initially hired as an executive for Pacific Network, Inc. and California Communications, Inc., companies that lease and sell sound systems, telecommunications equipment, and Muzak background music. 1970 - Divorces, moves to West Hollywood. 1974 - Joins Society of American Travel Writers (SATW) as an associate to promote the Delta Queen Steamboat. 1976 - Sells Muzak franchise and turns CCI into a post-production studio. Five years later, he sells all film editing equipment in an auction to become the first all-video post-production facility in Hollywood. 1986 - Diagnosed with terminal mesotheloma, due to exposure to asbestos as a panters's helper refurbishing ships for WWII at the Bremerton shipyards in 1944. Jan. 3, 1989 - Dies peacefully at home, surrounded by friends and family. 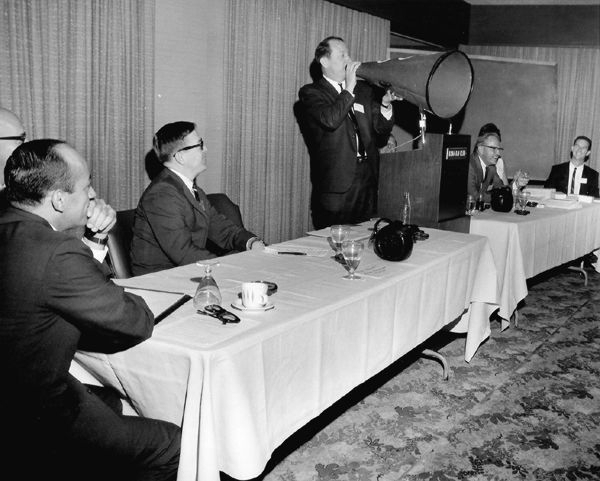 Muster illustrating a point with the CCI megaphone, c. 1962. Photo credit: Kaye Photo Services, Catamaran Hotel, San Diego. Muster with an ONA airplane, c. 1970. 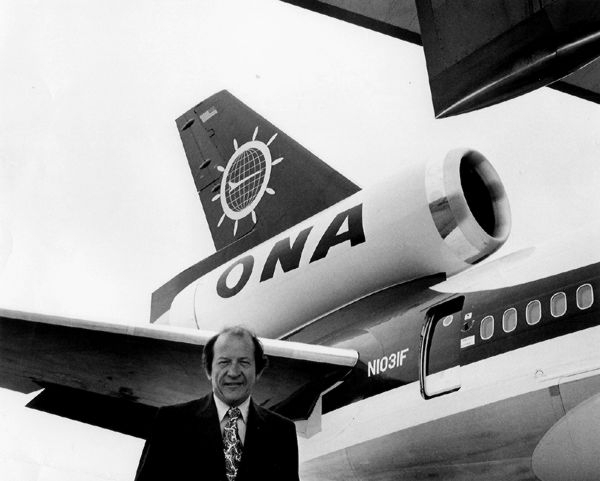 Overseas National Airline bought the Delta Queen Steamboat Company and owned it for approximately five years (1969 - 1974). ONA built the Mississippi Queen Steamboat. After resigning from the Delta Queen, Muster grew a beard and authored a series of travel books for Rand McNally. This was a publicity photo for America's Top 500 Sights to See, published to coincide with the American Bi-centennial in 1976, and World Traveler's Almanac, which had several editions in the 1970s (click here for Traveler's Almanac). 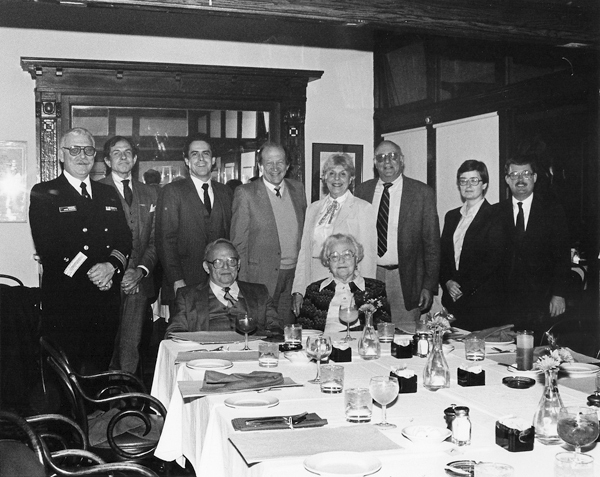 Commodore Harold DeMarrero, Gordon Greene, Patrick Fahey, Senior Vice President Delta Queen Steamboat Company, Bill Muster, Shirley Bernstein, Ben Bernstein - President, BB Enterprises, Joyce A. Early - Senior Vice President-Finance of Delta Queen Steamboat Company, Ron Marcou - Senior Vice President-Passenger Services, Delta Queen Steamboat Company. Foreground - Frank Fried, President Delta Queen Steamboat Company. 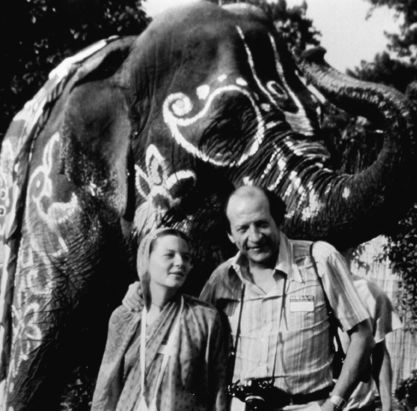 With daughter Nori at the Los Angeles Krishna center, 1979.